In one of the first systematic studies of style in Mexican filmmaking, a preeminent film scholar explores the creation of a Golden Age cinema that was uniquely Mexican in its themes, styles, and ideology. From the mid-1930s to the late 1950s, Mexican cinema became the most successful Latin American cinema and the leading Spanish-language film industry in the world. Many Cine de Oro (Golden Age cinema) films adhered to the dominant Hollywood model, but a small yet formidable filmmaking faction rejected Hollywood’s paradigm outright. Directors Fernando de Fuentes, Emilio Fernández, Luis Buñuel, Juan Bustillo Oro, Adolfo Best Maugard, and Julio Bracho sought to create a unique national cinema that, through the stories it told and the ways it told them, was wholly Mexican. The Classical Mexican Cinema traces the emergence and evolution of this Mexican cinematic aesthetic, a distinctive film form designed to express lo mexicano. Charles Ramírez Berg begins by locating the classical style’s pre-cinematic roots in the work of popular Mexican artist José Guadalupe Posada at the turn of the twentieth century. He also looks at the dawning of Mexican classicism in the poetics of Enrique Rosas’ El Automóvil Gris, the crowning achievement of Mexico’s silent filmmaking era and the film that set the stage for the Golden Age films. Berg then analyzes mature examples of classical Mexican filmmaking by the predominant Golden Age auteurs of three successive decades. Drawing on neoformalism and neoauteurism within a cultural studies framework, he brilliantly reveals how the poetics of Classical Mexican Cinema deviated from the formal norms of the Golden Age to express a uniquely Mexican sensibility thematically, stylistically, and ideologically. Chapter 9. Conclusion: What Happened to the Classical Mexican Cinema? Berg is Joe M. Dealy, Sr. Professor in Media Studies at the University of Texas at Austin, where he has won every major teaching award. He is the author of several books, including Latino Images in Film: Stereotypes, Subversion, and Resistance and Cinema of Solitude: A Critical Study of Mexican Film, 1967–1983 . In 1992, when I published Cinema of Solitude: A Critical Study of Mexican Film, 1967–1983, it was the first book-length critical study of Mexican cinema in English. Since then, I am happy to report, there has been a boom in the research and publishing of Mexican film history and criticism, both in English and in Spanish. It is heartening to see so much work of such high quality busily investigating Mexico’s rich and fascinating cinema. This flourishing Mexican film literature has employed numerous approaches and covered all historical periods, from the earliest days of the medium’s arrival in Mexico, through the silent era, the Golden Age, the subsequent crisis in the 1960s, the resurgence (Mexico’s Nuevo Cine) of the ’70s, the lull in the ’80s and ’90s, to its current renaissance in this millennium with the rise of contemporary auteurs such as Alfonso Cuarón, Guillermo del Toro, María Novarro, Alejandro González Iñárritu, Carlos Reygadas, Luis Estrada, Mariana Chenillo, and Fernando Eimbcke, among others. Some critics and historians, myself included, have focused their attention on the Cine de Oro, the transformative two-decade-long Golden Age that lasted from the mid-1930s to the late 1950s. During that time, Mexican cinema rose from near extinction at the end of the silent era to become the most successful Latin American cinema and the leading Spanish-language film industry in the world. But despite the flurry of research and publishing, the systematic study of the style of Mexican cinema has hardly been touched upon. Other than Eduardo de la Vega Alfaro’s monograph on Sergei Eisenstein in Mexico,1 articles I have published (which have been extensively reworked here), an essay by Evan Lieberman and Kerry Hegarty,and another by Patrick Keating,3 the investigation of the poetics of Mexican films in general and of the most honored films of the Golden Age in particular is still in its infancy. 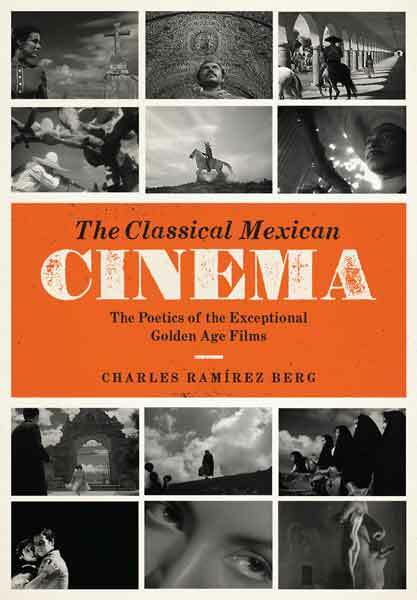 This book addresses that lack by examining the poetics of the Golden Age’s Classical Mexican Cinema, the name I have given to the era’s most esteemed films. My investigation concentrates on the development of Mexican film in the first half of the twentieth century. Beginning with the pre-cinema and early cinema period at the turn of the previous century, I analyze the illustrations of the prolific artist, cartoonist, and illustrator José Guadalupe Posada to note how his engravings set the stage for the Mexican filmmakers who would soon follow. My claim is that Posada was the font from which Mexican film as a whole and what I call the Classical Mexican Cinema flowed. Then I examine the poetics of Enrique Rosas’s El automóvil gris (1919), the crowning achievement of Mexico’s silent filmmaking. Based on an infamous string of revolution-era crimes, this remarkable docudrama marked the national cinema’s transition from documentaries that dominated national filmmaking from its inception in 1896 to the mid-1910s to narrative films that have commanded Mexican film production ever since. As such, El automóvil gris set the stage for the Golden Age films that came after the introduction of sound. This is followed by a chapter covering the beginning of Mexican sound films in the early 1930s and the resulting rebirth of Mexico’s cinema production. After that are three chapters that focus on the films produced by the predominant Golden Age auteurs of three successive decades: Fernando de Fuentes’s influential Revolution Trilogy from the 1930s; the collaboration of Emilio Fernández and his filmmaking unit, especially the films they made during the 1940s; and the Mexican films of the Spaniard Luis Buñuel, who moved to Mexico in the mid-1940s, became a Mexican citizen, and directed more than twenty films there during the next nineteen years. My last analytical chapter looks at three exceptional genre films directed by three important Golden Age directors—Juan Bustillo Oro, Adolfo Best Maugard, and Julio Bracho—in the 1930s and 1940s. Through the lens of poetics we can systematically study a director’s subjects, themes, formal strategies, and stylistic strategies, taken in relation to the normdriven practices of his period and place. The poetics framework is historical, because it mounts causal explanations of the movies’ distinctive qualities. It’s also analytical, because it asks us to scrutinize choices made by the director. Since studying the subjects, themes, and formal and stylistic strategies of the aforementioned Mexican filmmakers and their films is precisely my goal, the poetics of film approach perfectly suits my objectives here. I recognize that some critics regard the kind of neoformalist analysis practiced by Thompson and Bordwell as ahistorical and antithetical to cultural studies,but I don’t see anything inherent in the method that makes it so. Indeed, as Bordwell himself states, the poetics of cinema approach is meant to investigate style within a context, “in relation,” that is, “to the norm-driven practices” of the director’s period and place. Properly utilized, then, neoformalism is historical. It situates filmmakers and their films in a particular time and place. And it is analytical—not merely descriptive—since it carefully considers the choices directors made and asks why they made them. Furthermore, there is no reason why neoformalism cannot aid in unveiling a film’s ideological stance. In Ozu and the Poetics of Cinema, Bordwell used the results of his poetics of cinema analysis as the basis for a discussion about how those films transmitted political ideology.10 Indeed, I did much the same thing in chapter 2 of Latino Images in Film, where I performed a thorough neoformalist reading of a four-minute scene in Falling Down (1992) in order to demonstrate how following the standardized practices of Hollywood filmmaking may inadvertently serve to perpetuate the stereotyping of ethnic minorities. Of course, a lot depends on how the critical method is employed. To be sure, neoformalism can be practiced in an overly narrow, reductive, and shortsighted way—as can any analytical approach. However, applied appropriately, which I hope to do here, it need not be. Auteurism emphasized the personal signature at the expense of everything else (sometimes valuing a director’s work just because it could be demonstrated to have one) and, at the worst, claimed or at least implied that the author was solely and exclusively responsible for the meaning and quality of his texts. Its opponents countered this by pointing out that the author did not invent the language and conventions of his medium, the genre within which the work was located, the ideological assumptions inherent in the culture and necessarily reproduced . . . in the individual text; neither did the author control the conditions of production. Naturally, I’ll do this within the Mexican context. And I’ll take note of the play of ideology—both personal and social—within an individual film, across a body of work, within myself, and as it inflects my own critical assumptions. Though I am still following the standard auteurist methodology—looking for stylistic patterns and their repetition within a particular director’s body of work—it is my aim to be attentive enough to see the forest and the trees. One crippling pitfall of auteurism as it is sometimes practiced is that while going about its business of spotting an overarching directorial style across a director’s filmography, it fails to fully appreciate individual works, especially when they break from established patterns. This type of auteurism thus makes criticism a self-fulfilling prophecy—finding the pattern, looking for its repetitions, and ignoring elements that don’t fit. Here I have tried to be alive to patterns as well as to their absence, and to be alert to a director discarding one style in favor of another, since this might signal a new phase in an artist’s work, perhaps inaugurating a new pattern. Thus, for example, I note how the exhilarating cinematic experimentation exhibited in de Fuentes’s Revolution Trilogy is largely absent in the films he made afterward; how Fernández’s 1950s films differ so markedly from those he made the previous decade; and how Buñuel’s Mexican films evolved stylistically as they became more surreal. I will ground my neoformalist and neoauteurist analyses in a cultural studies approach, situating the films I treat within several contexts: historical, social, cultural, economic, industrial, ideological, and—because so much of Mexican filmmaking history revolves around its filmmakers’ vexed relationship to Hollywood—global. Films are never produced in a vacuum, and it behooves the historian and critic to be aware of and sensitive to the complex network of motivations, decisions, dreams, and desires bound up in the making of each one. This is the reason I begin a book on Golden Age cinema by examining the cultural history of image making in Mexico at the turn of the twentieth century. Starting there is the best way to appreciate how the work of the prolific printmaker José Guadalupe Posada created a visual template that the next generation of artists and filmmakers would use as they set out to create authentic Mexican art forms. Posada profoundly influenced artists like David Alfaro Siqueiros, José Clemente Orozco, and Diego Rivera, and they in turn influenced filmmakers such as director Emilio Fernández and cinematographer Gabriel Figueroa. Another example highlights the discrepancy that may arise between artistic intention and viewer reception. Emilio Fernández was proud of his Kikapú Indian ancestry. So it is no surprise that what brought him to the attention of international audiences and critics was María Candelaria (1943), a film where two top Mexican movie stars, Dolores del Río and Pedro Armendáriz, played indigenous protagonists. And yet despite the fact that Fernández’s goal was to celebrate indios and expose their deplorable treatment, the film’s depiction of them is deeply conflicted. At best, it sent mixed messages about Mexico’s indigenous people; at worst, it was yet another stereotypical representation of them. One more example will illustrate the necessity for the film critic to be aware of multiple contexts in analyzing a director’s work. This is especially important for neoformalist critics, and serves as a reminder that, from time to time, we need to step back from our close readings and take the bigger picture into account. This case demonstrates the complexities of international political and economic dynamics, and reveals how events may push and pull filmmakers in different ways, impact filmmaking, and shape a nation’s film culture. Let’s consider the reopening of global film markets after World War II and the diverse effects it had on two masterful Golden Age directors, Emilio Fernández and Luis Buñuel. For the first, the change severely damaged his standing as Mexico’s most lauded auteur and spelled the beginning of the end of his career. For the other, the reopened European markets brought him to the attention of international film financiers, which led to more filmmaking possibilities, reinvigorated his cinematic creativity, and helped popularize him as one of the foremost auteurs of world cinema. After 1950, Emilio Fernández’s films began looking more mainstream, containing fewer elements of the signature style he had developed in the 1940s. One reason was that he wasn’t always able to work with the team of collaborators that had assisted him in his ’40s films. Another was the overall decline in the quality of Mexican filmmaking in the 1950s, due to falling box office receipts, dwindling profits, and shrinking budgets. These were primarily caused by a change in Hollywood’s attitude toward the Mexican movie market. During World War II, at the urging of the U.S. government, Hollywood backed off from dominating Mexico’s film market. With the war over and the U.S. no longer in need of a strong hemispheric ally, Hollywood aggressively sought to recapture Mexico’s screens. Its success devastated Mexican filmmaking. Consequently, Fernández had to scramble to make films for less money and on shorter schedules than he had become accustomed to in the 1940s. His films suffered along with his reputation. Ironically, this downturn in Mexican filmmaking had a salubrious affect on Buñuel. A disciplined filmmaker who prepared meticulously, he had learned to operate with tight budgets and on short schedules. As he gradually gained the ability to make the films he wanted to make, many of his releases were well received nationally and internationally, and his career blossomed in the 1950s. His films’ increasing critical and commercial success outside of Mexico led to his securing foreign financing for his projects. Eventually, Buñuel moved his filmmaking to Europe, and the films of his second French period found a large international art film audience. Thus a single historic event, the postwar shift in movie marketing and financing, impacted the fates of two Classical Mexican Cinema directors in contrasting ways, bad for one, good for the other. There was nothing positive about the net effect on Mexican film culture, however. It was disastrous. Mexico lost two star auteurs, the quality of films dropped significantly, the Golden Age ended, and Mexican moviegoers abandoned their national cinema. Mexican film spiraled into a long decline, the most drastic since the 1920s. As I hope this brief historical sketch indicates, as much as possible I will place my close readings within multiple contexts, and always consider the implications of my findings on the broader story of Mexican cinema—and vice versa. Mexico’s movie industry can be traced back to the earliest days of silent film, but as the nation rebuilt after its revolution (1910–20), Mexican films were much less popular than Hollywood’s with Mexican audiences. “The American-made film—of whatever quality,” film historian Aurelio de los Reyes has written, “had been . . . the favorite of the entire Mexican public” since the late 1910s. Hollywood overwhelmed Mexico’s nascent film industry, and by the late 1920s, Mexican film production had almost completely disappeared. Of the 244 films exhibited in Mexico City in 1930, for example, 196 (80.4 percent) were Hollywood films, and only four (1.6 percent) were Mexican. As we will see, Hollywood’s film aesthetic became the accepted standard in Mexico—and indeed throughout the world. Though the Mexican film industry made a Phoenixlike rebirth with sound film in the early 1930s and had matured into a formidable national cinema by the end of that decade, Mexico’s audiences had grown accustomed to the Hollywood way of telling stories. In the main, and to the chagrin of film aesthetes who had hoped that Mexico would develop its own national cinematic aesthetic, Mexican cinema adopted the Hollywood filmmaking paradigm. As described by David Bordwell in The Classical Hollywood Cinema, the definitive study of the American studio style from 1917 to 1960 that he coauthored with Janet Staiger and Kristin Thompson, this paradigm is a set of cinematic norms for the fiction film that includes elements encompassed by three systems. First, the paradigm entails a system of narrative logic centered on cause-and-effect linkages of story events, a goal-oriented protagonist, and the adherence to Aristotelian narrative poetics. Second, it features a system of cinematic time that governs everything from shot duration to the temporal ordering of shots to favored story devices such as flashbacks and deadlines. Third, it involves a spatial system that constitutes filmic space as story space. Compositions privilege human bodies, centering and balancing them in the frame. The classical Hollywood filmmaking model, both as signifying practice and as industrial mode of production (including studio and star systems, powerful producers, well-developed distribution networks, and exhibition chains), was imitated in Mexico by the late 1930s as it embarked on what is now recognized as its cinematic Golden Age (el Cine de Oro), roughly from 1936 through 1957. Actually, most Mexican films adopted as well as adapted the Hollywood model, giving the Hollywood paradigm a decidedly Mexican inflection.20 By and large, as far as film style was concerned, the nation’s films adhered to the Hollywood model; however, there was a small but formidable filmmaking faction that rejected Hollywood’s paradigm outright. As a consequence, a central feature of Mexican cinema history in the first half of the twentieth century is the dynamic tension between those that followed the Hollywood style and those that spurned it. Accordingly, I have divided Mexico’s Golden Age cinema into two groups of films: the Mainstream Mexican Cinema (MMC) and the Classical Mexican Cinema (CMC). The majority of the Golden Age movies came from the MMC, works that had clearly adopted the Hollywood style, if with a Mexican flavor. The CMC, on the other hand, was a smaller but influential group of alternative films, many of which got noticed at home and at international festivals and are now considered canonical classics of the nation’s cinema. These were films made by directors in search of a Mexican cinematic aesthetic, a distinctive film form to express lo mexicano (Mexicanness). Though a minority practice, they were not by any means all that esoteric or uncommon, but rather products of the same industry as the MMC. Indeed, one of the most fascinating aspects of the Cine de Oro is that the Classical Mexican Cinema contested the MMC while appearing alongside it. Mexican film culture was spacious enough to allow films such as Fernando de Fuentes’s Revolution Trilogy, the Fernández unit’s dramas and melodramas, Julio Bracho’s searing indictment of the postrevolutionary status quo, and Buñuel’s surrealist provocations to play in theaters one week and then be followed the next by conventional, largely genrebased MMC movies—comedies, melodramas, cabaretera films, or comedias rancheras. Moreover, these CMC deviations from the Mexican filmic norm also played beside the slew of Hollywood films being exhibited in Mexico at the time. These CMC films, then, offered a look at “another cinema,” one that—from de Fuentes’s El prisionero 13 (Prisoner 13) in 1933 to Buñuel’s last Mexican-made film, Simón del desierto (Simon of the Desert) in 1965—successfully established itself apart from the standard Hollywood, European, and Mexican films that commanded most of the screen time in the nation’s theaters. This heterogeneous mix of MMC’s commercial films and CMC’s formal experimentation was much different from the homogeneous—well nigh monolithic—U.S. Hollywood filmmaking during the same era, where cases of formal experimentation were rare. As David Bordwell famously declared about the U.S. film industry’s output from 1917 to 1960: “In Hollywood cinema, there are no subversive films, only subversive moments. For social and economic reasons, no Hollywood film can provide a distinct and coherent alternative to the classical model.” My claim in this book is that for Mexico’s Golden Age cinema the situation was just the opposite. Major film artists were energetically exploring alternatives, consciously seeking a distinctive stylistic structure for Mexican movies. The films they produced deviated from the formal norm and expressed something different thematically, stylistically, and ideologically. In addition, these films were deliberate attempts to counter the Mainstream Mexican Cinema, which Classical Mexican Cinema directors regarded as undistinguished, uninspired, and highly derivative. The Mexican case is more similar to that in France, especially the films made there between the two world wars, when the film culture spectrum was expansive enough to include experiments on one end, mainstream commercial ventures on the other, and many intriguing blends of the two poles in between. By producing films that greatly broadened the range of Mexican cinema, CMC directors successfully countered Hollywoodin two ways. They made films that broke away from the Hollywood paradigm, and in so doing they established a Mexican film culture very different from that of the United States. The MMC generally followed Hollywood’s lead in everything from its star system and producer-based industrial organization down to shooting, editing, and lighting styles, set design, costuming, and makeup, as well as scripting and acting conventions. Since MMC films adhered so closely to the classical Hollywood cinema, a style that has been thoroughly explicated by Bordwell, Thompson, and Staiger,22 I feel that a neoformalist examination of those movies would be redundant and unnecessary. What does need to be analyzed, however, is the poetics of the Classical Mexican Cinema. Though these films were a numerical minority, their impact on Mexican film history was at least equal to and arguably greater than the majority MMC. These vibrant and significant movies were exceptional, a term I use in my title in two senses. First, I mean to indicate those Mexican films that were deemed extraordinary by virtue of their garnering worldwide attention, critical acclaim, and awards both at home and at international festivals—films, that is, like Fernández’s María Candelaria (1943), which put Mexican cinema on the international moviemaking map, and like Buñuel’s Los olvidados (1950) and Él (1953), which kept it there. Second, I use “exceptional” to point out that in the context of Mexican Golden Age filmmaking the CMC films were the exceptions, not the run-of-the-mill industrial product. They intentionally did not look or feel like mainstream Mexican films, and proudly stood apart stylistically and ideologically. This meant that their domestic reception was often mixed. Some CMC films were critically and commercially successful at home and abroad, like Fernández’s first films with Dolores del Río, Flor silvestre and María Candelaria (both 1943). Others failed at the box office and were shunned by local critics, only to be lauded overseas or rediscovered by a later generation, reevaluated, and eventually added to the canon of great Mexican films. This was the case with de Fuentes’s ¡Vámonos con Pancho Villa! (1936) as well as Buñuel’s Los olvidados (1950), two first-run failures that would rank #1 and #2 in a 1994 poll of Mexican filmmakers, critics, and historians conducted by Somos magazine.23 Just as some of the CMC films were immediately popular and others were not, some were genre films, and some were more difficult to categorize. But they were just as unmistakably Mexican as the MMC films (though we might have to exclude Buñuel’s literary adaptations, Robinson Crusoe  and Abismos de pasión [Wuthering Heights, 1954]). Formally, however, they were definitely idiosyncratic—vigorously accentuating a distinctive cinematic style in order to assert mexicanidad (Mexicanness). and editor Gloria Schoemann), and, interestingly enough, the Spanish-born Luis Buñuel. Besides the works of these directors, in chapter 8 I’ll discuss three more exceptional films, directed by Bustillo Oro, Best Maugard, and Bracho. How were the CMC films, which are the focus of this book, different from the Mainstream Mexican Cinema? A short list of CMC characteristics will help explain the distinction I am making. As I work my way down the list, keep in mind that it wasn’t so much that the elements present in CMC films were entirely absent in the MMC. Rather, it’s that all three of these features were regularly present in CMC films, and present to a greater degree than in their MMC counterparts, and that they were deliberately placed there by their directors. It would have been easy to narrate the plot [of El compadre Mendoza] in such a way that the conclusion was a happy one like we are used to seeing in American films; but it is our opinion that Mexican cinema ought to be a faithful reflection of our way of being, bleak and tragic, if what we are attempting is to present truthful profiles of ourselves, rather than making a poor imitation of what we are given by Hollywood. Similarly, Emilio Fernández’s films that he made with Gabriel Figueroa and the other members of his filmmaking team were a direct attack on the MMC, which Fernández derided as hardly Mexican at all, and little more than Hollywood in Spanish. Fernández and Figueroa’s shared ambition was to create a uniquely Mexican cinema, films that unambiguously and unmistakably explored Mexican themes, portrayed Mexican characters, and were set in a landscape that would be recognized by filmgoers the world over as—and only as—Mexico. For his part, Luis Buñuel worked out an informal arrangement with his first producer, the Russian émigré Oscar Dancigers, by which he agreed to direct commercial projects in exchange for the chance to make more personal films.26 In these productions he slowly but surely brought his surrealism to the fore, employing it to skewer machismo, burlesque the bourgeoisie, and challenge the narrative bedrock of Hollywood and MMC filmmaking—the happy ending. But even in his more commercial outings, Buñuel, the most consistently surrealist filmmaker in the history of cinema, found ways to smuggle in his irrational, dreamlike imagery. Second, CMC films purposely drew attention to their style. A fundamental aspect of the Hollywood paradigm was the understanding that a film’s style should never call attention to itself, an unwritten rule adopted by MMC directors and producers. CMC filmmakers, by contrast, produced films with formal elements that were meant to stand out and be noticed. As mentioned above and as will be discussed in chapter 5, de Fuentes intentionally gave all three films of the Revolution Trilogy tragic endings that he felt were truer to the Mexican experience. Consequently, the dramatic structure of these films was emphatically unlike that of the MMC and resulted in a different viewing experience for audiences. Fernández and Figueroa were so staunchly opposed to MMC filmmaking that they developed a nationalistic cinematic style to depict Mexico visually, one heavily influenced by Mexican painters, graphic artists, and muralists. The whole point of their formally ambitious project was for audiences to notice that their films looked different. As I’ll show in the three films I analyze in chapter 8, directors Juan Bustillo Oro, Adolfo Best Maugard, and Julio Bracho operated out of the same desire to experiment beyond the paradigmatic bounds of mainstream films. As far as Buñuel was concerned, he was busy developing his new, smoothly inconspicuous cinematic style and seemingly following Hollywood’s and the MMC’s “unobtrusiveness principle.” Until, that is, he tossed in another of his recurring “irrational sparks” and derailed a film’s narrative flow. Ever the wily surrealist, Buñuel used the MMC style in order to sabotage it. Third, CMC was ideologically oppositional. In large measure, the CMC’s opposition stemmed from a nationalistic impulse that was rooted in the 1910–20 revolution and that led to a corresponding revolution in the arts. Turning their backs on European and North American influences, Mexican artists sought to discover, define, and promote a native aesthetic. CMC filmmakers followed suit. As such, the CMC style was a declaration of cinematic independence whose overarching goal was to create movies that proclaimed mexicanidad. Aligning itself with contemporaneous nationalistic movements in all the Mexican arts, the CMC aesthetic in effect asserted that its films had succeeded in capturing the authentic Mexico, while MMC moviemaking—for all its Mexican characters, colorful colloquialisms, familiar locales, popular songs, and folkloric costumes—had not. From the vantage point of CMC filmmakers, the MMC had failed because its films were imitative of—one could even say infected by—the dominant Hollywood filmmaking paradigm. After all, Hollywood’s was a foreign style, developed to depict American characters engaged in the American experience, and never meant to convey lo mexicano. This difference becomes strikingly evident in the analysis of the dramatic structure of CMC films, which reveals how many were tragedies that broke away from Hollywood’s and the MMC’s standard three-act, happy-ending formula. The CMC was more pro-Mexican than rabidly anti-American, however. For Mexico to flourish after the revolution, the thinking went, it needed to find its true identity. This was as true of national politics as it was of the arts. Consequently, Mexican cinema, as de Fuentes, Fernández, and Figueroa argued, must be part of that nationalistic identification effort. The subjects of my analyses, artist José Guadalupe Posada and filmmakers Enrique Rosas, Fernando de Fuentes, Emilio Fernández and Gabriel Figueroa, Juan Bustillo Oro, Adolfo Best Maugard, and Julio Bracho, were all involved in this nation-defining mission, either implicitly (Posada and Rosas) or explicitly (the others). Luis Buñuel, however, the focus of chapter 7, was a special case. Though just as subversive, oppositional, and antiestablishment as the rest—if not more so— he was not part of the nationalistic project. Rather, his ideological opposition stemmed from a lifelong commitment to surrealism, whose primary motivation was the dismantling of the bourgeois status quo. “The real purpose of surrealism,” Buñuel wrote, “was . . . to explode the social order, to transform life itself.”27 Still, Buñuel was allied with the other CMC filmmakers because in attacking the status quo, he challenged the MMC. Of course, every film carries ideological content, wittingly or not. What I want to suggest is that the Classical Mexican Cinema’s ideological program was explicit, whereas the politics of the MMC were typically implicit and unthinking. Moreover, the ideology embedded in the MMC’s narratives typically celebrated the Mexican status quo—not surprising, since it was conveyed via a filmic style that was adopted from Hollywood. From the Classical Mexican Cinema perspective, then, the Mainstream Mexican Cinema was hopelessly conservative and retrograde. In effect, the CMC was filmmaking that said, “We fought a revolution to blaze new artistic trails and create a new form of cinematic expression for Mexico, not to revert to the status quo ante and copy foreign filmmaking models.” The CMC point of view was that filmmakers who relied on conventional filmmaking imitative of the Hollywood paradigm were merely another sign of how thoroughly the revolution had failed. These, then, are the defining characteristics of the Classical Mexican Cinema, the films and filmmakers that I analyze in this book. Not every film the CMC auteurs made was memorable, commercially or artistically successful, cinematically innovative, or ideologically confrontational. But many were, and focusing on the groundbreaking films from these filmmakers’ output reveals their individualistic styles, their aesthetic goals, and their ideological intentions. This book is dedicated to analyzing those films that exhibited these three characteristics, were aesthetically significant, and were cinematically exhilarating. The films, that is, that were artistically and ideologically special: the exceptional films of the Golden Age. Distinguishing between the MMC and Classical Mexican Cinema in this way means that I had to omit many popular and beloved Cine de Oro films—movies that are commonly accepted as part of Mexico’s cinematic canon, feature popular stars of the time, and appear on the Somos list of the best Mexican films of all time. In excluding these films, I’m neither disregarding their importance nor questioning their stature in Mexican film history. And I’m certainly not denying the fact that they are immensely entertaining, important, and enjoyable. They are all those things, something that the appearance of so many of them on the Somos list confirms. They are absent here because stylistically they adhered to—rather than deviated from—dominant Mexican and Hollywood filmmaking norms of the time. My focus here is the Classical Mexican Cinema, a remarkable body of work made by filmmakers consciously striving to forge a native cinematic form, express lo mexicano, and avoid imitating Hollywood. This book is the story of how, against the odds, they succeeded in finding a Mexican way to say something memorable, meaningful, and true about the national experience.